PARIS --- Belgium last week made public the full Request for Government Proposals (RfGP) that it sent to the five countries that it has selected to bid for the replacement of its F-16 fighters. Unexpectedly, the document does not appear to have been drafted to favor the Lockheed Martin F-35 Joint Strike Fighter, as did a previous request for information issued in 2014, but appears to allow an open competition which all five candidates – Boeing Super Hornet, Dassault Rafale, Eurofighter Typhoon, Lockheed F-35 and Saab Gripen – have a reasonable chance of winning. Final offers are due on February 14, 2018. Contrary to expectations, the final RfGP does not mention the nuclear strike mission, on which the air force command (Force Aérienne Belge, or FAB) had been counting to rationalize its preference for the F-35. 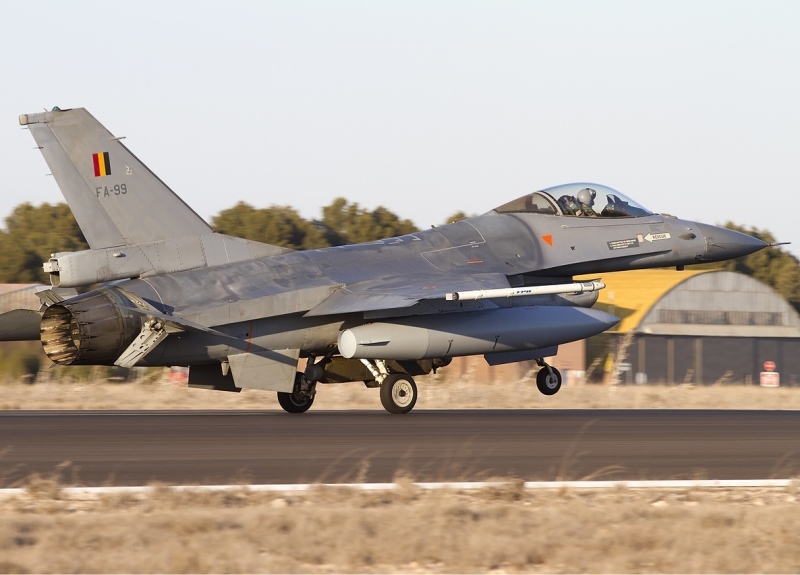 Although this has never been publicly admitted, it is an open secret that Belgium’s F-16 are configured to carry the US-made B-61 tactical nuclear bomb. The inclusion of a nuclear requirement for the new fighter would have de facto excluded the three European candidates: Sweden had already said it wouldn’t allow the Gripen to carry nuclear weapons, Eurofighter doesn’t have a nuclear role, and the United States would not allow their bomb to be integrated on the Rafale for reasons of secrecy. Thus, the FAB was confident that the inclusion of the nuclear mission would ensure selection of the F-35, which a previous defense minister, Pieter de Crem, had promised the United States that Belgium would buy. In fact, the final draft of the RFP doesn’t even mention the nuclear mission, which is hidden away under a sub-requirement for “growth potential,” and which in any case counts for less than 0.8% of the selection criteria. The Belgian government seems to have successfully side-stepped the trap by unexpectedly separating the two issues and selecting a new fighter while pushing the nuclear question back to the mid-2020s, when the F-16s will be retired and when the NATO nuclear strike mission may well have disappeared. By holding an open competition, Belgium stands in stark contrast with Australia, Italy, the UK and most recently Denmark, which in May 2016 said it would buy the F-35 on the basis of a report so slanted that Boeing earlier this month sued the Danish government. Belgium wants to buy 34 “new-build multi-role combat aircraft,” with initial deliveries beginning in 2023 and continuing at a rate of 4 or 5 aircraft per year until 2030. A budget of 3.573 billion euros has been earmarked for the purchase, rising to about 15 billion euros when operating costs are included. The RFP states that “Basic Operational Capability (BOC) allowing Quick Reaction Alert duties with the new weapon system should be possible by mid-2025,” with Initial Operational Capability to follow by mid-2027 and Full Operational Capability by late 2030. Unsurprisingly, capability accounts for 57% of the evaluation score, with financial costs accounting for 33% and the “protection of essential security interests,” which covers special equipment produced in Belgium, accounting for the final 10%. In terms of missions, Belgium has identified six major mission groups: Air to Air, Air to Ground Preplanned Targeting; Air to Ground Autonomous Targeting; Air to Ground Coordinated Targeting; Anti-Air Defence, including Suppression/destruction of Enemy Air Defences (SEAD), Electronic Warfare and Electronic Attack; and Intelligence, Surveillance, and Reconnaissance (ISR). Belgium plans on keeping its new aircraft in service until 2058, and to operate them from two air bases, Florennes and Kleine Brogel. In the build-up phase, between initial deliveries in 2023 and IOC in 2030, the new aircraft are expected to fly a total of 28,300 hours, with a monthly average of 13 hours per aircraft rising to 20 hours by 2030. During the follow-on period (2031-2058), the aircraft will fly an average of 7,950 flight hours per year, with a surge capacity up to 9,150 flight hours. This works out to an average usage profile of 240 hours per aircraft, with a surge capacity up to 270 hours per aircraft. Click here for the full text of the RFGP (247 PDF pages), on the website of Belgian Minister of Defence Steven Van De Put.